A wedding is such a magical event and for many, one of the most special days of their lives. The ceremony is the heart of the wedding. My aim is to listen to what you want, guide you if necessary, support you in getting the ceremony you desire and to create wonderful memories of your special day. In close consultation with you, I will help you design a unique and personalised ceremony, which fits any theme you may have. Together we will design your ceremony to incorporate your wishes, so it reflects your personalities, backgrounds and values. There are few ‘musts’ in a wedding ceremony, so you have a great amount of choice when it comes to designing your ceremony. It can be formal and intricate or casual and simple. 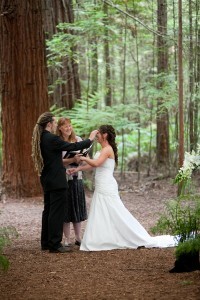 You may want to include some special ceremony elements, such as a candle, sand, rose or hand fasting ceremony, or a symbolic activity – E.g.. planting a tree, releasing doves, butterflies or blowing bubbles. It is great to include some personal stories in the ceremony such as how you met, the proposal and share the special qualities you see in the other. I will usually meet with you at my home in Kumeu to discuss your wedding. If distance is an issue, ceremony planning can be done via Skype, phone or email. 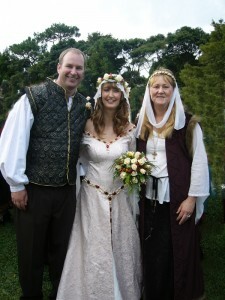 Some couples don’t know where to start with a ceremony, so I am happy to offer ideas, suggestions readings and vows. If you have no idea what you want and wording is not crucial to you, I am of course able to offer a beautiful simple standard wedding with a selection of vows or you can write you own. A rehearsal at the venue before the big day is not essential, (especially if your aim is for an fun informal atmosphere), and I can often ‘talk’ you through a rehearsal. In saying that, if there is a large wedding party a rehearsal can often ensure a smooth flow of proceedings on the day. Usually couples have a venue organised for their special day, but if not, I’m happy to recommend some lovely venues around West Auckland, which is well known for its stunning scenery and beaches. For an additional fee, I also have a wonderful garden area at my home suitable for an intimate – medium sized wedding (for up to 35 people) There’s also a covered Mediterranean courtyard as a wet weather alternative. See the ‘Casabella as a venue‘ page. I can even provide witnesses (at a small cost) if you are eloping or are having a private ceremony with no guests. For ceremony and venue costs look at FAQ page. Over the 400+ ceremonies I’ve been involved in, I’ve picked up a few ideas. Here are some tips I’ve put together for a great wedding. For further information on the legalities of getting married in New Zealand and how to apply for a marriage licence (which is your responsibility) go to www.bdm.govt.nz. Of course you want your ceremony to go according to plan. Contact us for our tips and ideas gathered over many ceremonies, to help your day run as smoothly as possible. I highly recommend using Perspectives Photo & Cinema. 'Marriage can make us free – to see, to be, to love. Our souls are protected; our hearts have come home'.